Today, thirty-six years ago, just six weeks before my baby brother was born, we had a death in the family. I am not being facetious when I say he was a member of our family. I really felt that way–about him and “Uncle Willie” Nelson too. I grew up hearing his music constantly. And seeing his movies. And wishing I could be BFF forever’s with Lisa Marie. I didn’t care much for Priscilla, because, really, how much sense could she have had NOT to be married to him anymore? I was young, and I didn’t know any better. Grace abounds, my friends. Daddy talked a lot about how Elvis was a better conductor than he was a musician and for sure, an actor. Daddy thought his “Elvis: Aloha from Hawaii” was proof that he was moving towards putting together musical “productions” rather than just singing a song–and he was good at it. The other day I heard the beginning of that concert on the radio. I once had the whole concert memorized. In order. It was awesome. When I was little we had a little record player that we children were allowed to use. 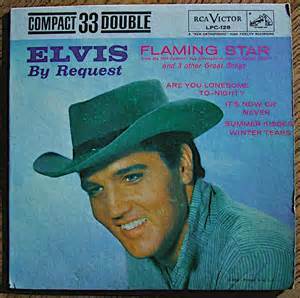 Daddy had a lot of 45’s that were Elvis singles, in addition to his LPs. I used to play like I was a DJ and I’d intro the song better than anybody on the airwaves. Or so I thought at the time. I knew my Elvis stuff, and I’d ooze it out as smooth as anything, and then…..I’d play the song. I loved his music and to this day, it’s a comforting thing for me. Elvis and crew in “Follow That Dream”–my favorite Elvis movie ever. Willie Nelson outdid him on “Always on My Mind.” I’m sorry, he just did. Having said that, while there are many Elvis songs that are so much fun that I can’t help but move (“Long Tall Sally,” “See See Rider,” “Blue Suede Shoes”), there are a few that have touched my heart and stayed there. “In the Ghetto”–I was crying right along with the Mama, and I still do. That song, much like Michael Jackson’s “Man in the Mirror” had me convinced I had to do something to change the brokenness in this world. No other song painted such a picture and inspired me at the same time. But I think it was his gospel songs that touched me the most. And in the American Trilogy, his “Glory Glory Hallelujah” gives me chills. Seriously. Sitting here blubbering, listening to it all over again. As I have been remembering the King of Rock and Roll today, I looked back at some album covers and the one from Flaming Star near about took my breath away. So many of them make me miss my Daddy, because the love of Elvis and his music and movies was something I shared with him. But that particular cover–I always thought Elvis kind of looked like Daddy in that one. I had forgotten that. Maybe it was the hat, I don’t know. But yeah, today I am missing so many people who left this world too soon. I remember when I heard the news back in 1977. For some reason I was the one to hear it first. I went in and told Mama. She didn’t believe me at first, that’s how far-fetched it was. After I remember just feeling hollow. And everything seemed so surreal. And today it seems like it was just yesterday. The awesome thing is that Aub and I have passed our love of Elvis down to the littles. As I was playing one of his songs a few minutes ago, they came running from the back of the house, “It’s Elvis! It’s Elvis!” Daddy would be pleased I think. So much seems in turmoil these days. It has been nice to sit down and remember simpler times and the joy that the music and movies of this man brought to our little family. I am thankful I have found a few moments of peace in the listening and remembering.